How Magento Aids in PCI Compliance for Online Stores? How Magento E-commerce Platform Aids in PCI Compliance? Your e-commerce platform can aid your success only when it excels in features like responsiveness, flexibility, agility, and user-friendliness. While most of these features assure return on the investment, the security and safety of e-commerce transaction ascertain that your customer trust you. The PCI compliance is your road to developing a safe and secure e-commerce platform. As card payments surged, everyone had difficulties relying on the transactions done through the virtual medium as real money was involved. Customers wanted something to assure them about the safety of their important data, account details, and login IDs. This led to the development of PCI compliance for all e-commerce solutions. As the e-commerce dealt heavily with online transactions, the industry embraced PCI compliance to process the payments. PCI or Payment Card Industry is a standard set of security guidelines crafted to determine that all e-commerce portals process, accept your card or bank account information through a secure environment. The PCI further witnessed authorization in 2006 where it got associated with the Security Standards Council in an effort to improve payment account security. The body also manages PCI DSS (Payment Security Council Data Security Standard) and acts as an independent entity created by ruling card brands like Visa, Discover, and American Express etc. It is important to note here that PCI compliance is not a mandatory law or a compulsory obligation. It is an organization-level initiative that handles payment data and relates information. The main aim of the body is to ensure that the consumer’s information stays safe while being used on an e-commerce platform. It is important to take into account the PCI compliance guidelines. For this, there are tools like Magento for e-commerce web development that provide various compliance levels to ensure the encryption of the personal data. How Magento helps in PCI compliance? E-commerce is an element of your business that helps you to create more revenue from your products. The platform or the software used to run the business should always be compliant. When we talk about Magento, it is not a PCI DSS certified platform. However, it makes things easy as it is linked to the payment bridge, which is responsible for carrying out all the card processing. This particular payment gateway is a dubbed tool and PCI DSS certified. The PCI compliance levels in Magento deals with payment bridge integration. When you create your e-commerce website with Magento, in order to integrate a reliable payment bridge you must be PCI certified. This reduces the burden on e-commerce platforms and often elevates the liability of card or bank processing systems. This feature provides Magento the advantage to enjoy certain liabilities. It further avoids undergoing certain re-certifications. Another advantage is that Magento separates the e-commerce and payment gateway platforms. This enables the addition of new features to the e-commerce platform without the need of going through PCI compliance again and again. Request your certificate by creating a certificate-signing request also called as CSR. After creating a CSR, you have to copy and paste it into the online order form where you can purchase your SSL. Post this, your business will have to be validated and documented. This is essential as the SSL authorities confirm that all the SSL certificates are sold to the legal entities. The validation process takes a couple of days and starts with the business owner validating the right to use the domain. A business owner should also confirm that his company is binding with all laws and authorities. For this, a list of documents has to be provided to ascertain business’ corroboration. After validation, you will be allowed to install the SSL certificate in your domain. You can also check if the SSL certificate is working correctly or not with the SSL checking tool. As evident enough, PCI compliance ensures a safe environment for the business transaction but also ensures that the best way to protect your customer information. Here are some more benefits of equipping your business with an appropriate PCI compliance level in Magento. It helps in increasing the customer trust by safeguarding their critical information. It also assures consumers that your website is a safer way of shopping. Customers are assured that their card’s account number, pin or password is safe. PCI certified online business grow better than non-compliant ones. The reliability helps increase your sales as customers tend to be comfortable sharing their financial details. Having a PCI compliant business will provide a competitive edge in today’s competition. It is no wonder that the market is filled with non-legitimate options. In this scenario, having a PCI compliant advantage up your sleeve will provide an edge in the competition. PCI compliance helps in avoiding lawsuits and cases. It also helps avoid revenue leaks like frauds, non-compliance fines, canceled accounts, payment card issues and other payment-related problems. Above all, being PCI compliant with Magento will give you the best of both the worlds. It will help you create an immaculate business portal and ensure that the transaction details are secure. An online store owner often focuses on development and marketing aspects when starting an online business. In the process, we often overlook the security aspect of the e-commerce portal we plan to create. 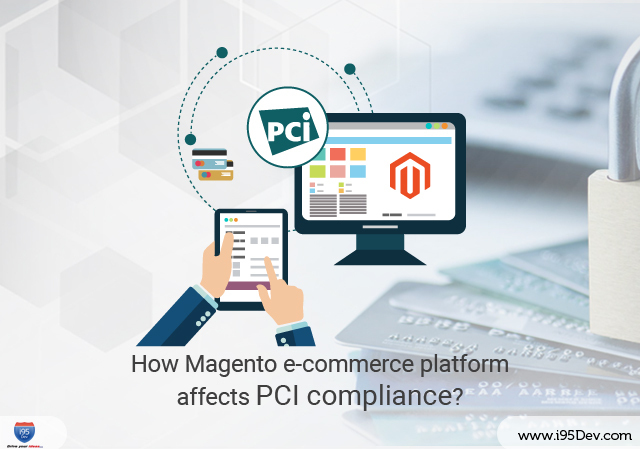 By ensuring the security of your customers, Magento with PCI compliance levels helps you in ticking all the right boxes and starting the voyage of online success. We are a Magento partner with decades of experience in helping emerging e-commerce companies build reliable and scalable online stores. We also helped many clients make sure they follow all the necessary security processes and compliances. To know more about getting your website PCI compliant or getting SSL certified, visit www.i95dev.com.